To query documents where at least one named inventor lives in a particular city, use the IC field code. If you are searching for cities and towns with common names like Greenville, Franklin, or Bristol, be sure to include the ICS or ICN (State and Country, respectively) field code as well. The IC field code is interesting when doing geo searches and charting documents using the Multi-Series charting option. 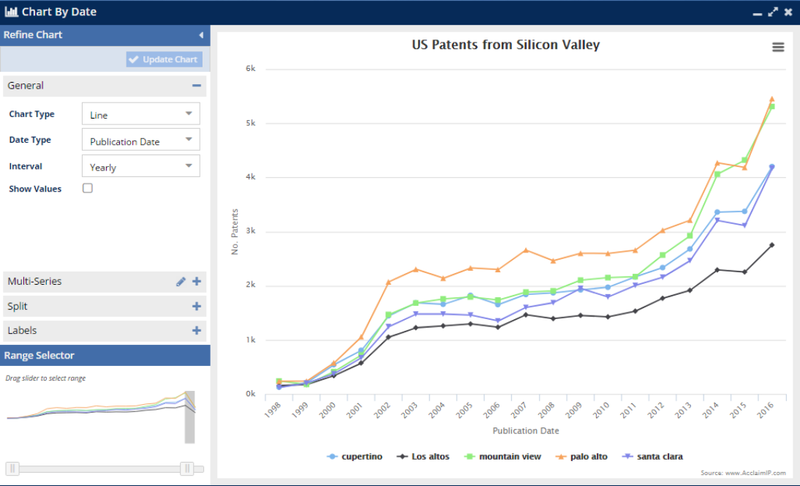 For example, the above chart shows publication trends for 1998 to 2016 for the cities in the Silicon Valley region. This snapshot can give you insight into several different aspects of an industry. IC:"Los Angeles" --> Patents from inventors living in Los Angeles.